There are 15 reviews of Montaigne. I found myself a bottle from 1986. Very pleased! Gorgeous oriental top notes. Every note, in its place. Every note, sounds off, making itself self known. Then, the notes all merge. The top notes, including the citrus are actually fairly well intact. The "top" is a medium to dark floral, a touch of spice, and bitter citrus. The middle remains somewhat "dark", brooding, always oriental but, with the addition of narcissus and black current. The vanilla from the base makes its way into the mix. Montaigne mellows, becomes smoother. I have always associated Caron with dark and deep fragrances. I'd been attracted to them since the late 80's / early 90's. They may have been a bit more "mature" for me back then. I loved them anyway. I am very glad I discovered Montaigne once again. It is better than I remembered. Later on, an amber-sweet accord appears. More vanilla, with the addition of ambrette and mild sandalwood. Wintery, warm, and alluring. It fits right in, with modern perfumes of orient stylings. They were pushing Montaigne like a drug last holiday season at Nordstrom. The elaborate displays suggested that the promotion was Caron’s not the store’s and I wondered what the motive was. Were Montaigne sales slack? Does Caron think Montaigne is one of their more approachable fragrances, and hence a good “entry level” selection? Did they just have excess stock to unload? I don’t suppose I’ll ever know. I don’t know about “approachable” but Montaigne is certainly conventional. In style it’s a straightforward floral oriental, with all of the expected components: sweet spiced citrus, a bouquet of white flowers, and a sweet vanilla-amber foundation. These same building blocks have served for scents as fine and varied as Byzance, Ysatis, Boucheron, Tocade, Flower, Amaranthine, and Insolence. In Montaigne’s case it’s the white floral accord that dominates, aligning it more closely with Byzance, Boucheron, and Ysatis than comparatively streamlined, modernistic scents such as Flower or Tocade. I can detect jasmine, rose, tuberose, and orange blossom among Montaigne’s floral notes. Though the arrangement is moderately indolic, it is so generously seasoned with aldehydes that it smells clean and soapy, rather than decadent and animalic. The amber and vanilla in the base notes are offset by a very smooth, creamy wood accord. Without the woods Montaigne might be oppressively sweet, but their presence assures adequate balance. The drydown, with its remnants of soapy florals tempered by soft woods and amber, is my favorite part of this fragrance. In its parfum concentration Montaigne projects and lasts well, but I don’t find it as oppressively heavy or overbearing as Boucheron or Insolence can be when over-applied. After a few wearings I appreciate Montaigne as a solid, pleasant scent, though nothing terribly exciting. Caron offers more stimulating orientals in Nuit de Noël and Parfum Sacré, and in the heady white flower-floral oriental field Byzance, Boucheron, and Amaranthine present equally fine, though more distinctive alternatives. This is an ideal scent for gifting a young lady in her late teens or early twenties. It is exuberant, cheerful and confident. The fruity mandarin and blackcurrant float over tuberose, jasmine and mimose, supported by coriander, vanilla and sandalwood. Although much too fruity for my tastes, I can still objectively rate Montaigne as a marvelous Caron creation for the very young and young in heart. There is - after a boisterous opening - a steady stream of perfume that reminds me of vintages. Full, even, long lasting. I am not good at describing notes, but a warm haystack comes to mind. It gets better and better as it dries down. Thumbs up for a classy perfume. Exhuberant. Quite loud. Opens with rich fruits and then switches over to florals, I get a lot of tuberose over a vanilla base. This is the EdP. The parfum on the other hand plays out the same way, but is more luscious and quiet. I adore Caron and must eat crow having villified the house and Richard Fraysse since I loathed Parfum Sacre and was totally baffled how Tabac Blond could be interpreted as a leather. But Infini? Sweet mother of God how lovely! Montaigne? Pure cheerfulness. I love that Caron still offers so many of their scents in extrait, that alone, is very vintage. I think they beat Guerlain hands down. I don't see me reaching for Montaigne too too often, but I'm glad I have it. Infini is my go to Holy Grail . . . so far. I am now on a mission to try them all. A few minutes alone with Caron MONTAIGNE (edp) is time enough to convince me I am in the presence of a stunning beauty. While many floral orientals tend to go heavy on the syrupy sweetness, Caron has managed to keep the saccharine base to more tasteful levels, allowing the heart of the fragrance to blossom in all its splendor. It makes me smile and I'm not even sure why. There is this certain joie de vivre about this Caron that simply lifts my spirit. Not unlike a secret joke shared between friends with a wink or a knowing smile. The barely concealed tension between powdery and lush floral accords is the cherry on the cake or if one is so inclined to think, the glossy red smacker that leaves a gentleman bewitched, bothered...and bewildered. 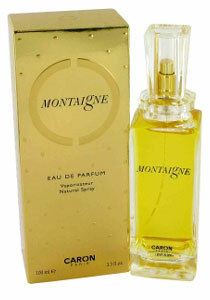 CARON MONTAIGNE 1.7 oz - 50 ml EDT SPRAY , NIB , SEALED . CARON MONTAIGNE WOMEN'S EDT SPRAY 1.7 OZ / 50 ML, WHITE BOX , SEALED,VINTAGE. Why is my Review on CARON - Montaigne not accepted and posted ? Montaigne by Caron - your opinions, please.